We've done some really fun hikes with some incredible people and one "bull" in the last few weeks but life has gotten in the way of finishing my reports. But the new year is upon us and I'm determined to get back in the game! This is the third or so New Year's Day in a row we've been able to celebrate with a hike. Today, we met up with Hannah and Lilo to do the Sugarloafs off of Zealand Road. The air temp hovered around freezing with a sometimes-bitter wind that we quickly escaped once on Zealand Road and away from the open parking lot (which, FYI is about a quarter mile down the road (south) and possibly marked for the snowmobile trail). Zealand Road was well packed and we barebooted the mile up to the second bridge, in front of which is all the signage, and just after which is the trailhead (marked with the traditional hiker stick figure duo). It seemed to be a fairly busy day for sledding and everyone who passed us was friendly. It's worth noting that, just over the first bridge to the (seasonally closed) picnic area, is an outlet of the snowmobile trail. Then, in the area of the trailhead, the road and snowmobile trail run in unison again momentarily. The road was a good way to ease into the day, shifting packs and gauging layers. We passed a handful of others, mostly heading back towards the highway and some on skis. Once on the Sugarloaf/Trestle Trail, my kiddos and I only saw one other pair during our ascent of North Sugarloaf later on. Other than that, we wouldn't see another person til our return to Zealand Road. The Sugarloaf Trail ran alongside Zealand River for two tenths of a mile before the Trestle Trail continued straight and we veered left and up to stay with Sugarloaf. 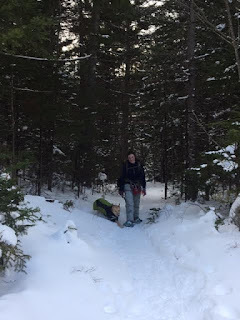 We crossed the snowmobile trail once more and entered the woods. Massholes passing on the left! The trail started easy, with flat to gentle gains and neat sights, like massive, split boulders. After the rocks, it gained moderately, but still with a flatter section before more of a "push" up to the col where one can go left for Middle and right for North. Although I haven't done Pleasant (Shawnee Ski Area) in the winter, I think this would be a fair comparison to the ledges trail. We headed towards Middle Sugarloaf, knowing it was purported to have the best views of the two and that we'd only be doing one. The spur to the summit was a nice mix of quickly shifting grades and turns. I call them Dr. Seuss trees; other call them marshmallow trees. Just before the summit ledges, we encountered the ladder, which is a perfect angle for summer and only slightly challenging in snowshoes! Crazy ole lady ran up and down, up and down! Photo courtesy of Hannah B. The summit astounded me. I'm calling it a wraparound summit. The open space available to take everything in was huge. First we turned left for the Presi's, then curved right for quite awhile, amazed. The Presi's, conveniently under cloud cover, are to the left of the frame. either of us has had. Lesson learned. I could've stayed there all afternoon. Even with the wind, the sheer size of the available places to explore and peaks to see was mesmerizing. We will definitely return!! 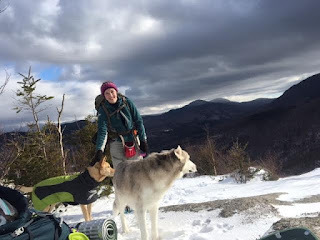 Back at the col, Ty and Tango sprang forward into the undisturbed snow on North Peak's spur. And so, with Hannah's approval (but not Lilo's), we struck out for North Peak. That was a very quick .3 mile of breaking trail. It was flat at first, then down a hill (always fun, going up to go down!) before entering thicker woods and ascending to the top. The views seem closer to the Presi's but more limited in overall scope. A very worthwhile side trip though, and with the couple of clearings, seems a nice place for a break on a warmer day. around disorienting boulders, with no tracks to follow. We made haste returning to the junction, at which point, Ty indicated her intention to return to Middle Sugarloaf. When I told her to find Hannah and Lilo instead, she careened down the hill with Tango not far behind. 25" snowshoes aren't exactly conducive to graceful, efficient jogging but I did my best to keep up. As I said in a post last year, when Tango runs, you run! Reuniting at the snowmobile trail crossing. 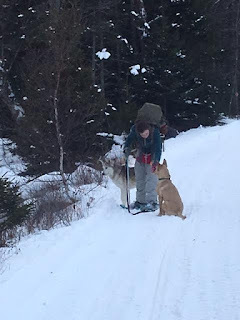 Back at the intersection with the snowmobile trail, we met up with Hannah and Lilo, who thankfully hadn't been waiting long. The return was a nice, quick jaunt with Ty and Lilo running quite far ahead (for different reasons!). less than a leash-length away! Once I got my wits about me, it became a training opportunity! The Sugarloaf Trail instantly jumped to the top of our list. Ty would argue the trail is too short but there are ways to extend it. It's not a difficult hiking, being of mostly easy to moderate grades and relatively short in length. It's been awhile but I would say, for the sake of comparison, it's similar in difficulty to Welch-Dickey, if not slightly easier. The views and trail are varied, making the time pass quickly (as does good conversation). The summit is absolutely stellar and well worth what some might consider "too short" a hike for a drive up to the Whites. 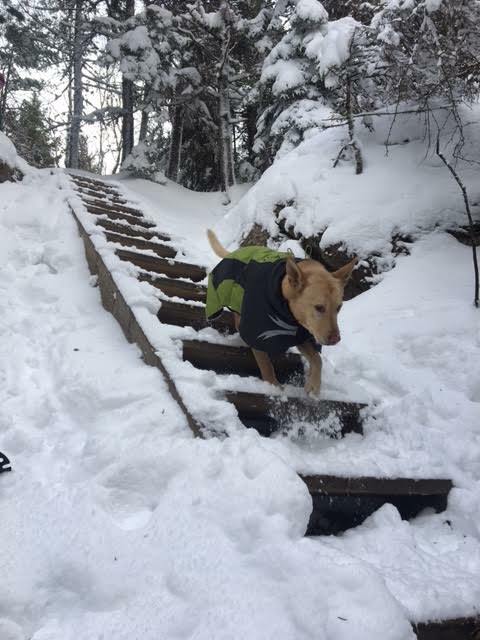 Other than using caution and respecting the multi-use nature of certain parts of Zealand Road, there's nothing I can think of that doesn't make this a great dog hike. The ladder isn't steep and the boards are a good size. The ledges are at a gently sloping angle. They do seem to drop eventually and hazardously but intrinsically cautious dogs will be okay. Ty pushed herself a little too far, spooked us both, and was okay. Their bouncing , happy gait alone tells me the Sugarloafs are very dog approved! I can't wait to return on a bluebird day and see what Erick thinks!